“Happiness seems like a butterfly – oh so close, but eluding us when we try to grab it, “this simple yet intriguing saying of Prabhu Gaur Gopal Das provides a glimpse into his erudite personality, wisdom and his message. 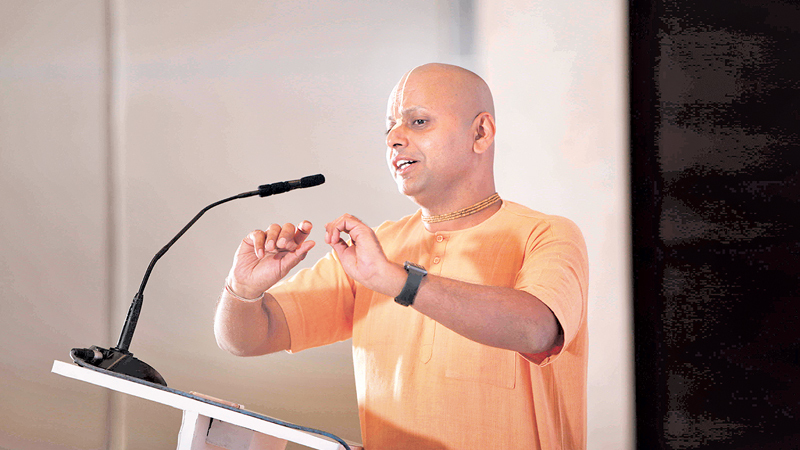 An electrical engineer by profession and a former high powered executive at Hewlett Packard, Gaur Gopal Das is a life coach, a mentor and a world-renowned public speaker much admired for his humorous approach to discussing deep philosophical ideas and helping professionals across all disciplines around the globe to develop skillful means to lead rich and fulfilling lives. Born in 1873, Gaur Gopal Das obtained his Bachelor’s degree in Electrical engineering from the College of Engineering Pune in 1995. Following a brief stint at Hewlett-Packard, he took the life-altering decision of exploring his spiritual life by becoming a disciple of His Holiness Radhanath Swami and sharing his wisdom and insights with countless others as a life coach. He joined the International Society for Krishna Consciousness (ISKCON) Mumbai in 1996. His timely approach to seeking solutions to life’s deeper problems through cultivating self-awareness, compassion and authenticity in all areas of life to succeed and find that elusive happiness during the journey won him many admirers. His TEDx speeches remain some of the best material that the forum had shared and continuous to share with the world. In 2016, he won the Rotary International’s Super Achiever Award for outstanding contribution in the field of spirituality and inspiration. His charismatic personality and inspirational speeches have motivated thousands of leading professional, young students as well as employees of corporate giants such as Infosys, Barclays, Bank of America, E&Y, Ford. Prabhu Gaur Gopal Das finds inspiration to deliver his message about happiness and living a stress-free and a rewarding life from his own spiritual life as a senior monk. Organizations across the world seek him out to educate their employees about compassionate leadership styles and building harmonious and positive-result inducing work relationships. Prabhu Gaur Gopal Das’s own lifestyle and success inspire his audience to practice mindfulness to create an inclusive work culture where dynamism and harmony blend together to ultimately build a better place for all employees and stakeholders. At an individual level, his audience benefits from the discussions and practical steps that this inspirational teacher reveals about coping with stress through understanding the cause and effect of psychological stress. He delves deep into the ancient perspectives about happiness to help each listener to seek new perceptions about this age-old question and cultivate fulfilling habits. In the style of a true spiritual leader, Prabhu Gaur Gopal Das uses humour to convey his message and keep his audience engaged. His witty yet meaningful messages and phrases linger in the minds of listeners long after the speech, encouraging them to apply wisdom to make life better for themselves, their loved ones and all those who come into contact with them. Gaur Gopal Das’s message encourages his listeners to approach life as a journey that they share with others. He stresses the importance of building a valuable support system and seeking and giving emotional support from and to family and friends while deepening one’s spiritual life with guidance from a teacher. Above, all he encourages his listeners to seek balance and wisdom for themselves. In his recent Ted Talk published on 4th January 2017, Gaur Gopal Das says that ‘the truth about life is that it is like a jigsaw puzzle and we can only experience completeness when all the pieces fit together’.